Apologetics Press - A Messiah Who "Sneaks" Into History? As Paul stood before King Agrippa’s throne, relating the story of Christ, he declared of the Messiah’s life: “This thing was not done in a corner” (Acts 26:26). Those few words have reverberated through centuries of history as one of the hallmarks of the story of Jesus. Never was the life, death, or resurrection of Christ meant to be kept secret—as something might be when it is stored away in a box in an abandoned attic, to be discovered later by accident only by a fortunate few. Rather, the many facets of Christ’s earthly ministry were readily available for inspection by anyone, anytime, anywhere. In fact, centuries before Christ set foot on the Earth in human form, the prophets of old repeatedly had spoken of His impending arrival. Over 300 messianic prophecies fill the pages of the Old Testament. God did not try to “sneak” the Messiah into human affairs under cover of darkness and without warning. Truth be told, He went to considerable effort to announce to the world the news of its heralded Savior. One such instance can be found in Genesis 49:10, wherein Moses wrote: “The scepter shall not depart from Judah, nor a lawgiver from between his feet, until Shiloh comes.” The word “Shiloh” has long been recognized by biblical scholars as another name for the Messiah. This verse, then, explains exactly when the Messiah was to arrive—when the scepter had departed from Judah. So what is the “scepter,” and when did it depart from Judah? The scepter was a staff kept in possession of the elders of each of the twelve tribes of Israel and engraved with the name of the tribe. It symbolized the national sovereignty and judicial power of God’s people. As long as the scepter was in place, the Jews could govern themselves, excommunicate one of their own, and even administer corporeal punishment (including the death penalty). Interestingly, the scepter remained in place even while the Jews were in captivity under both the Babylonians and the Medes and Persians. It also remained in place for a time under Roman captivity—until the Emperor instituted procurators. When that occurred, even first-century Jews recognized the departure of the scepter because the Romans (around A.D. 11) took away the Jews’ right to administer capital punishment. 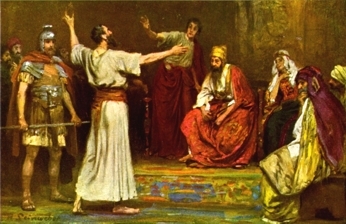 One Jewish teacher, rabbi Rachmon, put the situation in these terms: “When the members of the Sanhedrin found themselves deprived of their right over life and death, a general consternation took possession of them; they covered their heads with ashes, and their bodies with sackcloth, exclaiming: ‘Woe unto us, for the scepter has departed from Judah, and the Messiah has not come’ ” (as quoted in McDowell, 1999, p. 195). When the members of the Sanhedrin found that they could not put Jesus to death themselves, but had to request instead that Pontius Pilate, the Roman procurator, do so on their behalf (Luke 23:24), they should have known the Messiah was in their midst, for that was the exact prophecy Moses had recorded. The scepter had indeed departed from Judah—and the Messiah had indeed come! Yet the Jews ignored the voice of God and demanded the death sentence for His only begotten Son. Why? Because they were the people who “always resisted the Holy Spirit” (Acts 7:51). Woe to those individuals in our day and age who ignore the powerful evidence that God has provided as proof of the deity of His precious Son, Jesus Christ! Let us ensure that we today do not become as blind to Christ’s Sonship as those first-century Jews. McDowell, Josh (1999), The New Evidence that Demands a Verdict (Nashville, TN: Thomas Nelson).